The RBA's September Financial Stability Review made the entirely uncontroversial (indeed, almost inarguable!) statement that the self managed superannuation fund (“SMSF”) sector, now that it is permitted to borrow for investment, is a new vehicle for potentially speculative demand for property. On the back of this statement, some commentators have claimed SMSFs would soon drive property prices into the stratosphere. ASIC has also weighed into the debate about SMSFs and their exposure to property which is creating a national perception that SMSFs are recklessly investing into property and this will cause a housing market supply and price crisis. However, recently released figures from the SMSF regulator the ATO just don't bear out such fears. According to the ATO as at 30 June 2013, statistics indicate that of the $495 billion SMSF sector, only $75 billion (15%) was invested in property assets, of which just $17 billion or 3.5% was residential. Commercial property holdings are actually more common in SMSFs because many small business owners hold their business premises in their SMSF. Moreover total property holdings of the SMSF sector at 15.15% of total funds, almost precisely mirror the standard 15% allocation to property in the balanced option of a large superannuation fund! Borrowing has been permitted by SMSFs for six years, yet geared assets in SMSFs are just 0.48% of total assets. This is hardly a tsunami of demand by anyone's standards and whilst there's no doubt that regulators may need to keep a close eye on the sector, to ensure SMSF members are not being talked into inappropriate investment by high powered salespeople charging large commissions as was the case in Storm and Westpoint both of whom collapsed, media claims that the sector is rife with property leverage and speculation are clearly inaccurate and do not hold water. 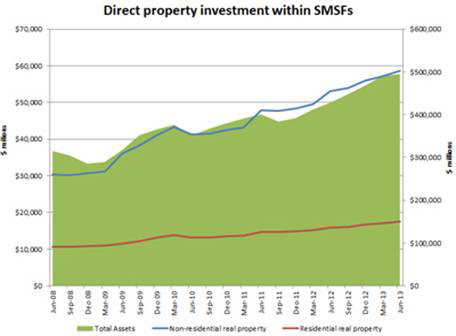 As the graph below shows, the growth of commercial and residential property holdings in SMSFs is not out of proportion to the growth in total assets. Indeed, far from affecting house prices, such growth as there is seems largely directed to the commercial property sector. Why SMSFs are important to the Australian economy? The government first allowed SMSFs to borrow to buy property in September 2007 and then the global financial crisis hit. It has taken several years for product providers to build “limited recourse” products tailored to SMSFs. SMSFs now have circa $507 billion in assets but as indicated the amount invested in housing right now is tiny: only $17.5 billion, or 3.5 per cent. About $314 billion of SMSF money is spread evenly across cash and equities making SMSF portfolios look like larger superfunds and not reckless self interested tax evaders as they have often been portrayed. The formation rate (new SMSF registrations at the ATO) has been exploding over the past number of years with over 500,000 SMSFs now registered and overwhelmingly being formed by older people (45 years and up) in preparation for their retirement. This appears to reflect a level of quite deep dissatisfaction with superannuation professionals and an understandable want to control their own money. SMSF individuals also do so in the knowledge that their “nest egg” is no longer under the Treasurer's discretion to step in and “in the national interest” replenish or make good investment losses. This means SMSFs are ‘truly independent of system’ and take on their investment risk seriously because it is their own money when they invest it. SMSFs could, therefore, possibly reshape the housing market in both positive and negative ways. Some surveys suggest SMSFs want to commit 30 per cent of their savings to housing, which implies $152 billion for investment. The key question is whether SMSFs use their cash ballast as deposits for leveraged housing investments or invest in other assets. Deducting current holdings indicates about $135 billion of unmet housing demand. That’s a huge number and represents 70 per cent of the total value of home sales over the last year. So what if SMSFs use the $135 billion in latent cash available for housing as the 30 per cent equity alongside a 70 per cent home loan? This means they would actually be buying $449 billion of total housing (or 2.4 times the past year’s worth of sales). Total current SMSF assets would jump 59 per cent from $507 billion to $804 billion. The portfolio weight to cash and equities would fall from 62 per cent to 40 per cent while real estate’s share would rise to about 56 per cent. The whole debate about whether SMSFs influence housing prices adversely revolves around where all this SMSF purchasing power ends up. If it flows into new housing supply, it could help solve how we are going to accommodate 15 million new residents over the next 35 years. 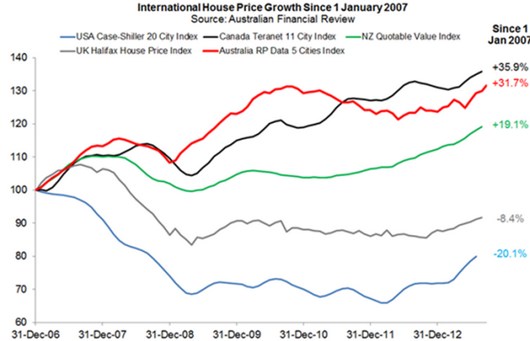 If, on the other hand, it goes mostly into buying existing homes, it could fuel current deep supply imbalances. The potential (not actual yet) impact of SMSFs on Australia’s banking and housing markets is potentially bigger than most people realise. Today, most credit providers offer SMSFs the ability to borrow up to 80 per cent of a property’s value at standard variable rates with 30-year terms. Several also allow borrowers to repay interest only – not any principal – on the loan for up to 15 years. Some SMSF savers will have no direct housing investments, but others will own a home. Surveys suggest that almost 30 per cent of families think the wisest place for savings is housing. As an asset class, housing has three advantages: familiarity; the availability of cheaper leverage for longer terms than any other investment; and the perception of very low risk. The above analysis gives us a broad feel for current SMSF housing demand, which could range from $150 billion to $450 billion. It is static and assumes no further growth in SMSF assets. Of course, the pool of SMSF money will expand as a function of super contributions and as SMSFs take more market share away from traditional funds. It is, for example, conceivable that the SMSF share of the total super market will rise to closer to half as more savers take control of their financial futures. 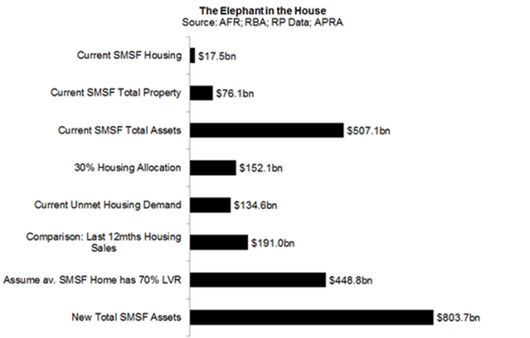 If they decide to leverage up their cash to buy housing, the relative size of SMSFs would increase further. It’s a really interesting debate and we include our pictorial infographic on the SMSF sector for your use. La Trobe Financial is proud to have recently introduced an SMSF loan Product with a market rate of 5.60% pa ( comparison rate 5.71%) for brokers to consider this very large and growing market.